In the main event Australia’s Robert Whittaker will finally get the home title defence he deserves when he takes on American No. 4-ranked contender Kelvin Gastelum in a middleweight bout at Melbourne’s Rod Laver Arena. 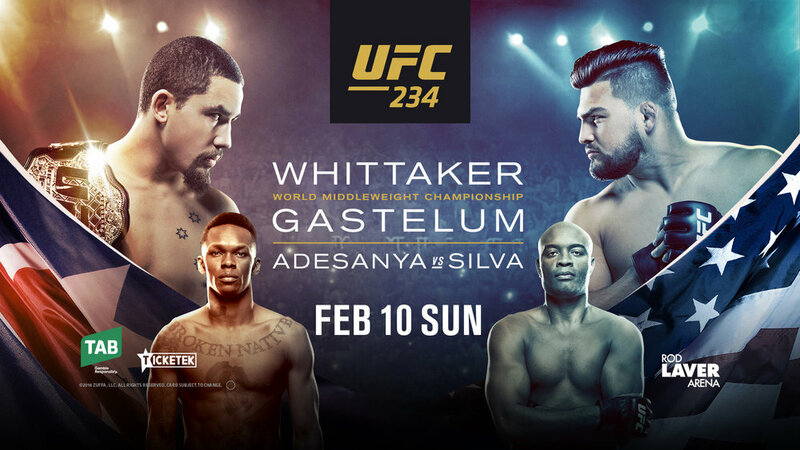 The co-main event features the hottest 185-pound prospect on UFC’s roster today, New Zealand’s Israel Adesanya, as he looks to get over on one of the most decorated former champions ever, Anderson Silva. Also on the card Australian Nadia Kassem will make her return to the Octagon taking on Montana De La Rosa. Kassem (5-0), who boasts an unbeaten record as a professional. made her UFC debut in Sydney last year, defeating Alex Chambers by unanimous decision. Fresh off a win in his UFC debut defeating Scotsman Paul Craig with a third-round Kimura Australian light-heavyweight Jim Crute looks to improve his 9-0 professional record against Ryan Spann (15-5). Spann also won his UFC debut this past September with a unanimous decision victory over Luis Henrique Barbosa de Oliveira.